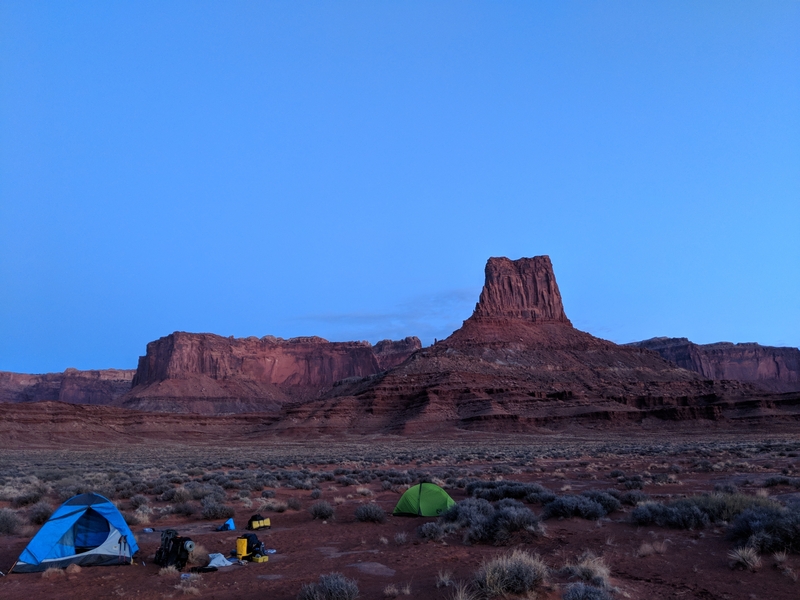 After the 26-hour long haul from Tennessee to Utah, our party of four started off down the Lathrop Trace Trail in Canyonlands National Park at 5 p.m. With little light remaining, we rushed to complete the first section so as to find a campsite with what little light remained. Setting off down Lathrop Trace Trail. Hiking into dawn marked the start of an exceptional journey. Quite awhile after the sun had set, we arrived at a suitable campsite. Tents were set up with great efficiency to roar of the Jet Boil cooking our simple dinner of red lentils and quinoa. With dinner complete and cookware cleaned, two of us settled into our sleeping bags for the night. After 26 hours of straight driving and little sleep, my closed cell foam sleeping pad felt more luxurious than any high tech, multilayered memory foam mattress that money could buy. After little contemplation, we relocated the tents to a more favorable location farther from this most unsavory cliffside. 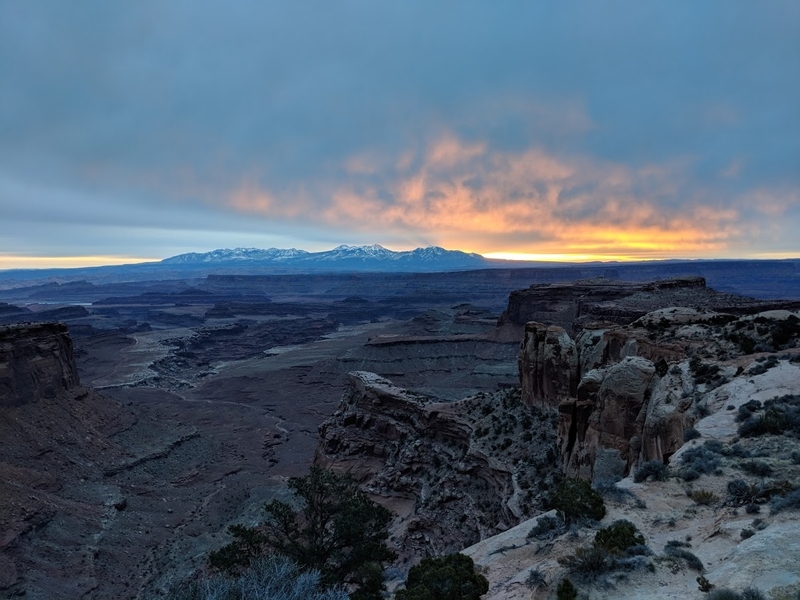 The next morning, we arose to discover a spectacular sunrise above the distant mountains that framed our hike in the last few hours before dusk the day before. A move well worth making. An exceptional sunrise on day two. 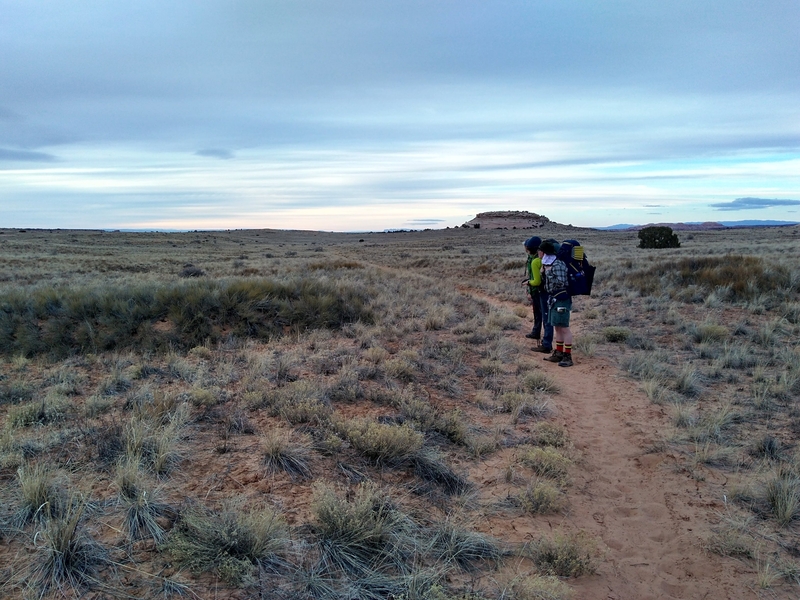 After breakfast, our party pushed on toward the sunrise, eventually reaching the slick rock on the White Rim. 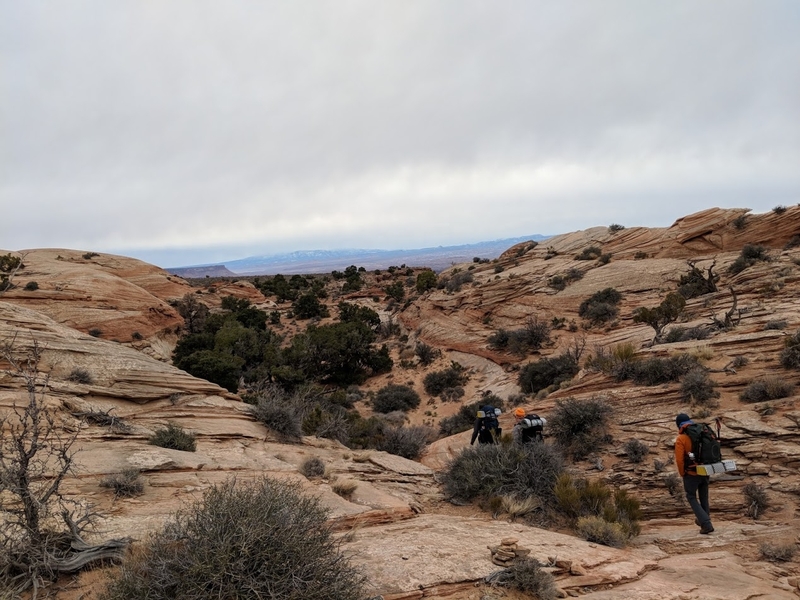 The slickrock, shaped by years of erosion, seemed to capture the very nature of the water that had formed it over the eons, flowing and spilling over itself in a manner akin to a river. Traversing the slickrock toward the White Rim. 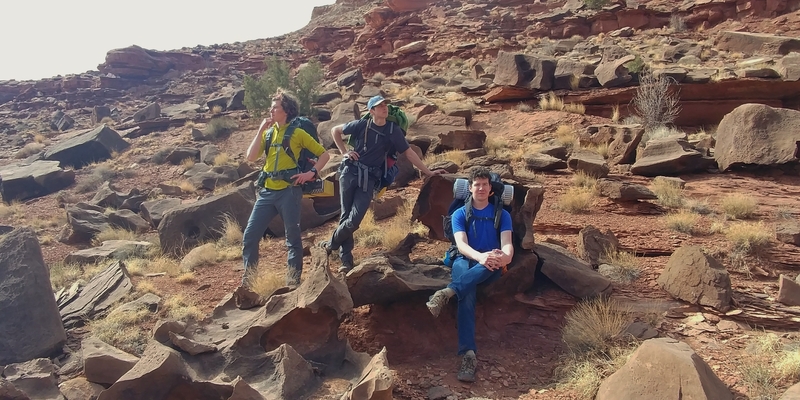 Eventually, we reached the White Rim, and began our descent into the canyon. 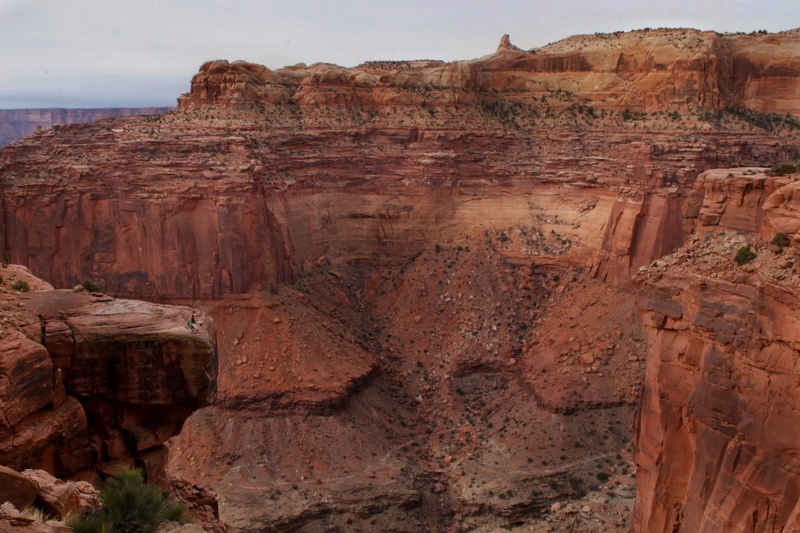 As we descended, the enormity of the canyon’s features became increasingly apparent. The drops off the cliffsides were unreal, the boulders immense, and the distances perplexing. What appeared to be a mere mile away ended up being five miles distant. 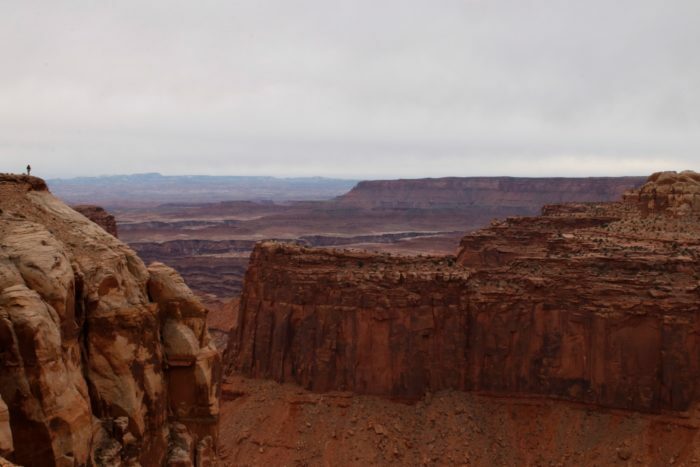 This was certainly the most poignant phenomenon I experienced in the Canyonlands; I doubt I shall ever forget it. The Standing Rock over the canyon lent some perspective on the vastness of this place. 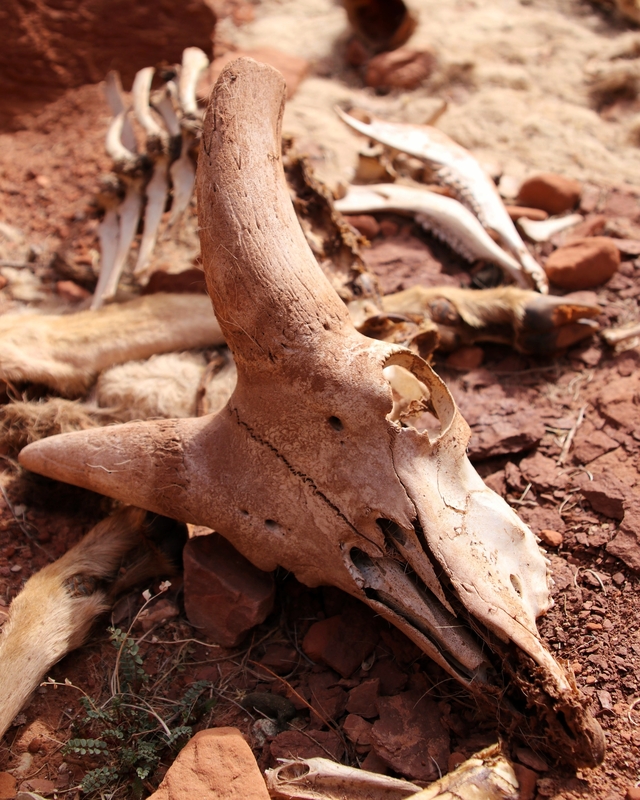 Our first day brought encounters with multiple lizards, mysterious vegetation, and the skeleton of some unfortunate bighorn sheep. Our party stopped to observe the scene (which appeared as if straight out of a Western film) and ponder the cause of the creature’s untimely demise. 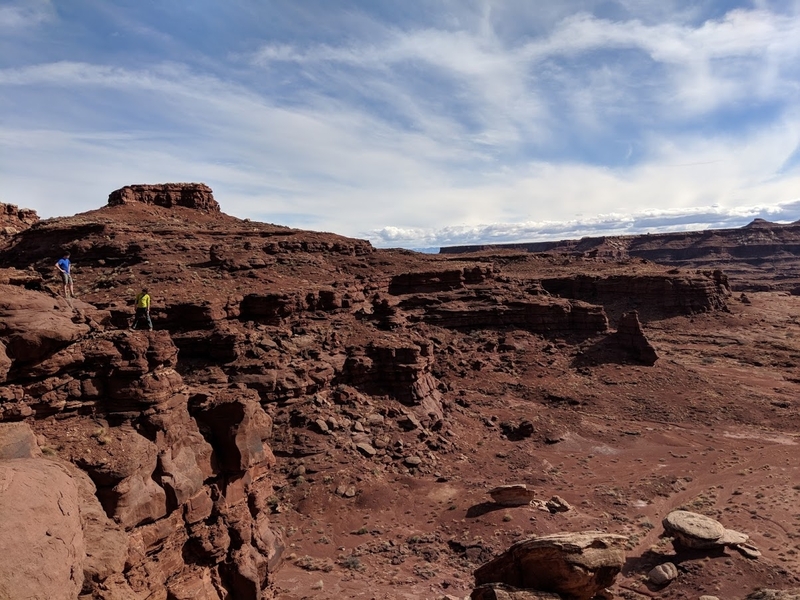 After our eight-mile hike down from the White Rim, we reached the old jeep trail at the bottom of the outer canyon. 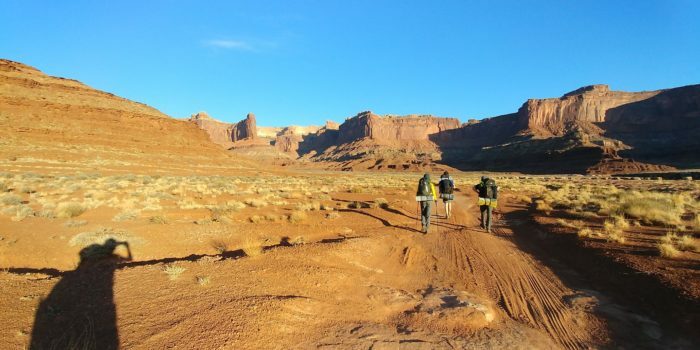 Making our way down the jeep trail, we began scouting out campsites, taking note of the soil that surrounded us. Lunch among some rocks of notable character. The soil in this area is alive with biological soil crust. Made of lichen, mosses, algae, fungi, and bacteria, it is the keeper of the desert’s health. It is a fragile keeper, though: one misplaced step would kill the soil, slowing its growth by at least 50 years. Eventually, our party made camp below Airport Tower, a butte which, when squinted at from just the right angle (with some imagination), somewhat resembled an airport tower. Our camp below the Airport Tower. After setting up camp, our party descended into the nearby canyon toward the Colorado River. Here we were responsible for some canyoneering – a first for everyone in our party. Our party made quick work of finding routes down the cliffs, but time ran thin as the sun neared the horizon. Only a couple of miles short of the river, we turned back, following our original route back up the canyon. Once we’d reached the rim and neared the Airport Tower, I spotted two small, foreign black objects near our campsite. Fear struck me as I considered the possibility that some creature was devouring our closely calculated food supply. 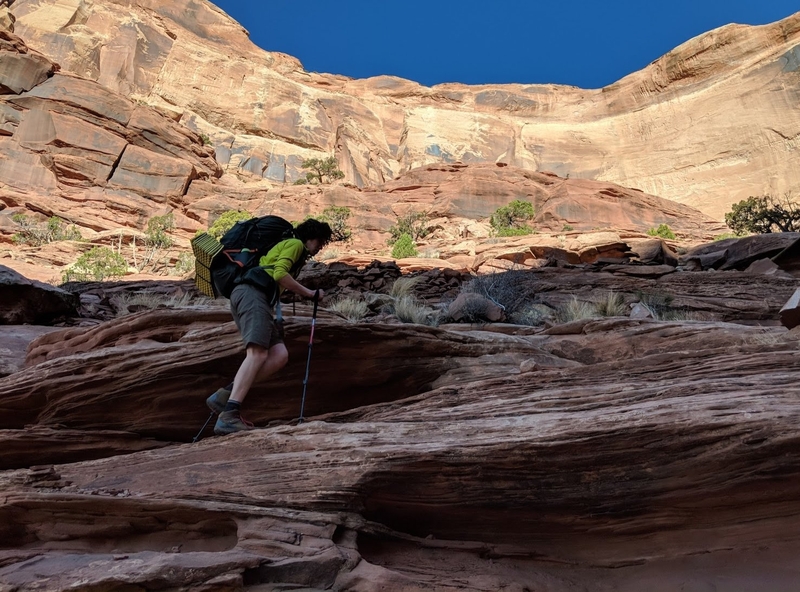 As we ran toward our camp, we soon discovered that this was indeed the nature of the situation: two ravens were pecking away at one of the food bags that our party member Houston had forgotten to stow before we set off down the canyon. After scaring off the ravens, we discovered that they had eaten our breakfast and one bag of trail mix for the next day’s lunch. Fortunately the consequences were minimal: a lesson and a light breakfast. I cooked dinner once again as the sun set behind a minimally clouded horizon. Red beans and rice tonight. The night rolled in as the clouds cleared, providing exceptional views of the stars. 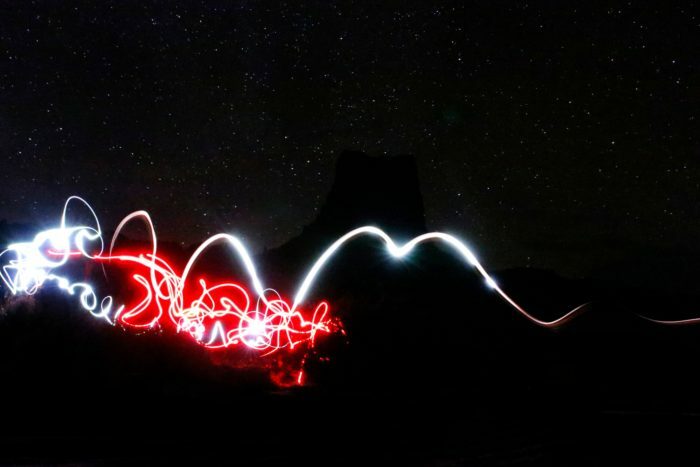 After discussing constellations, skin-walkers, and weather, I experimented with some long-exposure photography – a concept I was excited to try. As I executed the shot, the others painted the scene before the Airport Tower, which was enshrouded in a night sky one could easily get lost in. Light painting in front of the Airport Tower. The rushes of wind sung us to sleep. 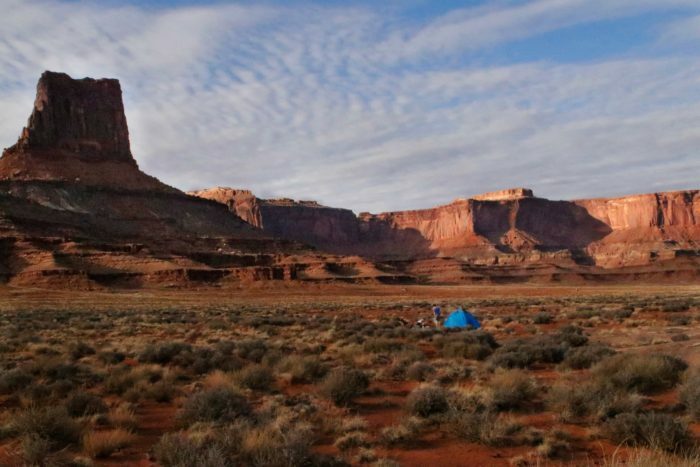 The next day, we broke camp quickly, set on covering the eight miles back up the canyon before 1 p.m. so we could begin our drive to the Grand Canyon as planned. Electric Light Orchestra’s “Mr. Blue Sky” set the pace for the morning over the trusty Bluetooth speaker. Setting off up the old jeep trail to the tune of E.L.O. The ascent up the cliffs we’d descended only the day before was refreshing, clearing both mind and soul. The fresh perspective enabled further comprehension of the canyon’s ways – the effects of slides, erosion, and the like were all more apparent. Quite astonishing that such simple phenomena created such vast beauty. Hoofin’ it up the canyon. 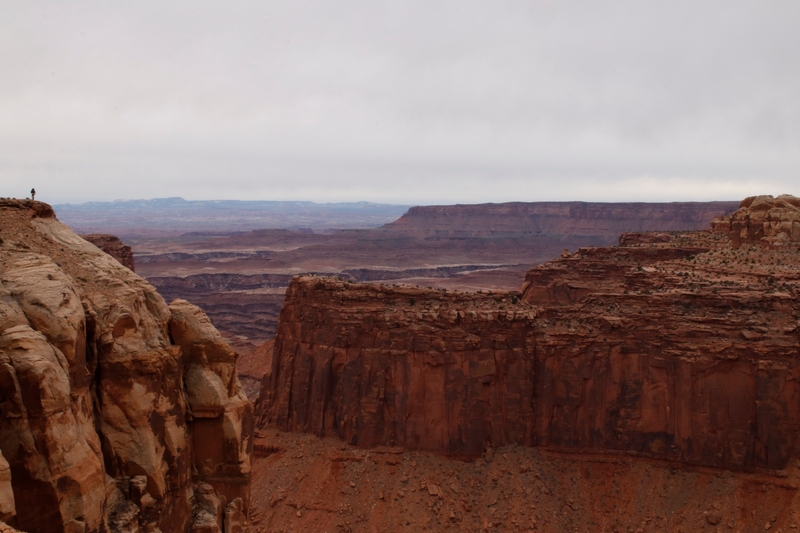 As we reached the White Rim, so too did a bighorn sheep, albeit headed in the opposite direction. We stood, mouths agape, at this majestic creature. With little worry or care, it continued past us just off the trail, no more than ten feet distant. Having never seen a (live) bighorn, the bighorn seemed to capture all that was majestic and wonderful of the canyons in living form. 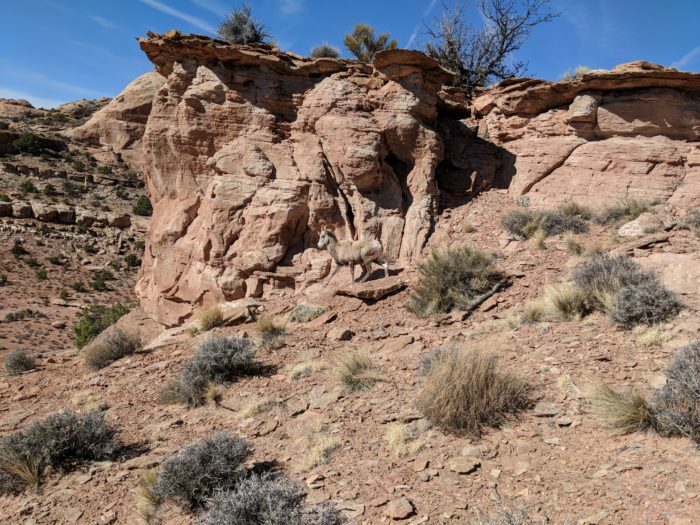 A bighorn sheep causing trail erosion. Not shortly thereafter we returned to the car, left to reflect on this sublime trip into the depths of Utah’s Canyonlands as we set off for the Grand Canyon.